West Yorkshire’s quirkiest town has given us one more reason to visit: new ramps and a Hebden Bridge Access Map! The new map has been launched by the Hebden Bridge Disability Access Forum (HBDAF) and illustrates accessible routes around the town centre, including wheelchair accessible pavements, accessible toilets, bus stops and parking spaces. Turn the map over and you’ll find more useful information, including a list of places which have step-free access, hearing loops and accessible toilets. The information has been collected by HBDAF members from the area, and some of the town’s venues have been upgraded thanks to grants from the 2017 Accessible Hebden project, funded by Community Foundation for Calderdale, CFFC. Photo: Judy, HBDAF, trying out one of the new ramps. It’s not just the new map that’s making a difference in Hebden Bridge: numerous portable ramps have been issued to shops around the town. The first four ramps were delivered in February this year to Just Books, Dragonfly Boutique, Rohan Outdoor and Age UK charity shop. 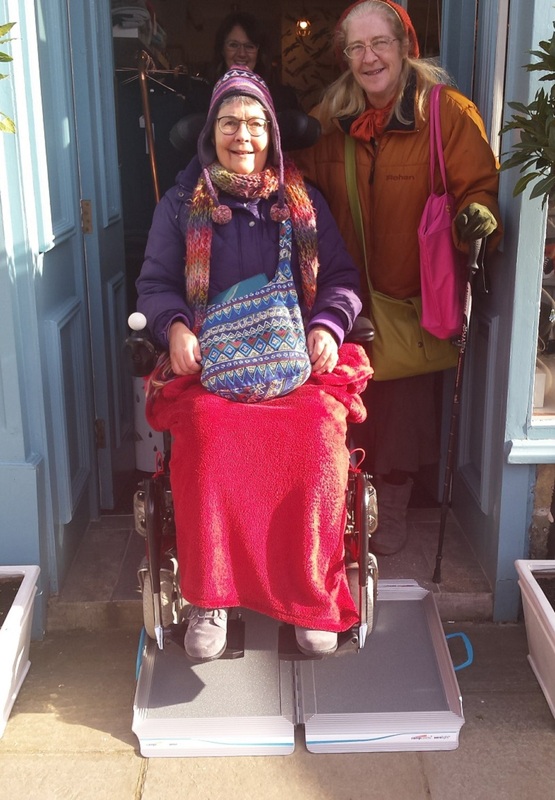 One HDBAF member and wheelchair user got involved with the project by testing out the ramps using a powerchair user and was delighted to be able to access a bookshop for the first time in 26 years! Look out for stickers on shop windows to indicate whether there’s a portable ramp inside. More shops have since received ramps, including Heart Gallery, Rendezvous Café, the Stubbing Wharf pub, Humblest of Pleasures café and L.T.D Boutique. As a town with a reputation for independent shops and cafes, it’s exciting to see more of these places becoming accessible for everybody. Download your map here or pop into the Hebden Bridge Library, Town Hall, Visitor Centre, Hebden Bridge Station or Valley Medical Centre to pick up a paper copy. There is also a handy list of places to visit with step-free access here. If you’re a local or visitor who would like to meet up with the HBDAF, head to Hebden Bridge Town Hall at 2.30pm on the third Monday of each month!